I decided to post this measuring cup for my favorite kitchen tool this week. I have an old version of the measuring cup. It came from Pampered Chef. I keep my all purpose white flour in a large tupperware container. In my flour I keep, or I should say kept, this measuring cup. Mine recently broke. That is why the picture came off the pampered chef website. I could not show you a picture of mine. Well, I could have but mine is in two pieces that no longer stay together. Now that mine is broken I realize how much I loved having it in my flour container. 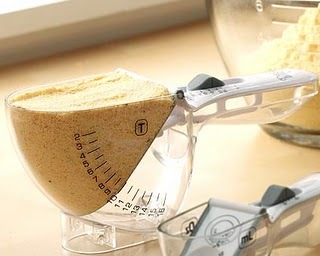 Since it is adjustable I never had to dirty another measuring cup when baking things. It has such a large range of measurements that I never needed anything else unless I just need 1 tablespoon. I really miss mine, can you tell. I did not know how much quicker this made measuring until it broke. For more great tools see Life As Mom. I just found your site… but did you see about relacing it? I just had a pampered chef party and she said many times that most of the products have some type of replacement time… You should call and see. Pampered chef does have great guarentees. I have used it on some stoneware that craked. But I have had this at least 5 years so I don’t think they would replace it. I think they guarentee stuff for 1-3 years on most stuff. Sometimes if you call the local rep, then can add your order onto someone else locally who is having a party. Then you don’t have to wait for someone you know to invite you. Thanks I may have to try that!